Tree plantings and ground cover, such as low growing dense perennial turf grass sod in urban areas and communities, can aid in reducing carbon dioxide emissions, mitigating the heat island effect and reducing energy consumption, thus contributing to reduce global warming trends. 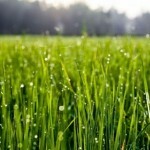 625 square feet of lawn provides enough oxygen for one person for an entire day. On a block of eight average houses, front lawns have the cooling effect of 70 tons of air conditioning. Turf absorbs gaseous pollutants such as carbon dioxide and sulfur dioxide, converting them to oxygen. Turf traps an estimated 12 million tons of dust and dirt released annually into the atmosphere. A buffer zone of grass around buildings helps retard the spread of fire. Turf prevents soil erosion, filters contaminants from rainwater and reduces runoff. Not only is sod good for the environment, it will add value and improve the curb appeal of your property. The increased attention your property gets after a makeover will move a house quicker if you’re in the market to sell. Or, if you are not selling, the new look will make you feel good to just sit and enjoy it. Really...the best sod in NM! Very high quality sod and the best customer service in the industry!!!! Thanks for your hard work!